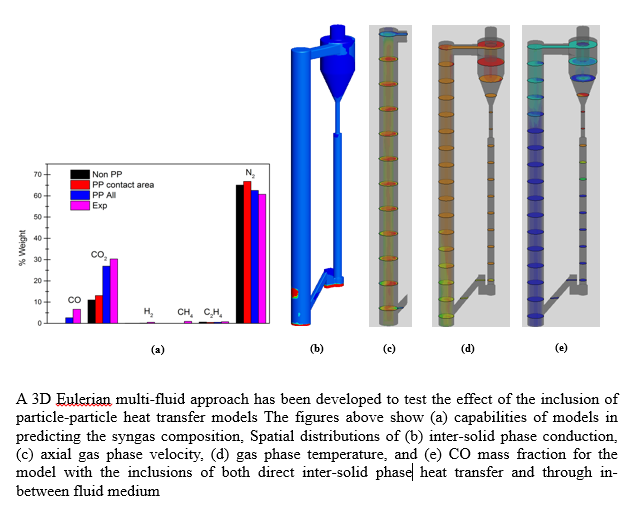 A three-dimensional Eulerian Multi-Fluid Model (MFM) of biomass gasification in full-loop Circulating Fluidized Beds (CFBs) has been developed. The conservation equations of mass, momentum, and energy are solved by well-known Navier-Stokes formulation types. The Kinetic Theory of Granular Flow (KTGF), common chemical reactions in biomass gasification, and standard k-? turbulence model are considered. These equations are used to describe the spatial velocity, temperature, and concentration for each phase and species. The inter-solid phase heat-transfer mechanisms, which consist of direct solid-solid conduction and solid-solid conduction through fluid medium, are also considered. The results are compared to existing experimental data. It is demonstrated that the model which considers all inter-solid phase heat-transfer mechanisms provides better predictions in terms of synthetic gas (syngas) compositions than the model considering direct solid-solid conduction through contact area only and the model without solid-solid heat-transfer mechanisms. From this, hydrodynamics and heat and mass transfer inside this complex system are analyzed. The results can be useful for better design and optimization of biomass gasification in CFBs. The increase in energy demands to support the economic growth of societies and countries, and the decrease in available natural energy resources, such as petroleum, gas, and coal, necessitate the use of renewable energy to achieve global energy security. Among the renewable resources available, biomass is the only hydrocarbon energy source that can be converted into other useful solid, liquid, and gaseous forms. Furthermore, biomass has advantages over fossil fuels, such as low carbon emissions and abundant supply. Currently, biomass comprises 14% of the total energy used worldwide. The major problems associated with the direct use of biomass––difficulties in handling, transport, and feeding–– result from its poor properties in terms of grinding and flow ability. Thus, it is necessary to convert biomass to other convenient forms such as liquid or gaseous fuels in order to improve handling and transportation. Biochemical and thermochemical processes are the two methods used to convert biomass into other forms of energy. Of these, gasification is one of thermochemical processes that is effective in producing synthetic gas (syngas). Syngas consists mainly of CO and H2 and can be used in fuel cells and internal combustion engines or converted into liquid fuels (Ahmad et al., 2016). Many types of biomass gasifiers, such as fixed bed, fluidized bed, and CFBs, are frequently used. Fixed bed and bubbling fluidized bed gasifier types have been intensively used in previous studies (Atnaw et al., 2012; Winaya et al., 2015) and among these CFB is one of the most promising, since it is characterized by excellent solid mixing and efficient heat and mass transfers. To date, many experimental studies have been carried out to investigate aspects of biomass gasification in CFBs, for example Guo et al. (2014), Hussain et al. (2013), Li et al. (2004), and Garc? ?a-Ibañez et al. (2004). Even though data and information obtained from previous experimental studies are useful in practical terms, they are less useful theoretically because they are not comprehensive enough to describe the underlying mechanism of hydrodynamics and heat and mass transfer in CFBs. Moreover, these data and information are only valid for the range of operating variables and specific CFB geometry for which they were generated. Therefore, in order to describe the behaviors of hydrodynamics, heat transfer, and chemical reaction using these data, it is necessary to replicate the operating and geometry models. Some efforts to develop numerical models have been carried out in order to gain comprehensive information on transport phenomena in CFBs. Two common numerical approaches used are the MFM and computational fluid dynamics coupled with the discrete element method (CFD-DEM). MFM is easier to use since it requires less computation than CFD-DEM. In recent years, MFM has been frequently applied to the study of biomass gasification in fluidized beds, for example Yu et al. (2007), Gerber et al. (2010), and Singh et al. (2013). Liu et al. (2013) have recently developed a numerical method in the MFM framework to study biomass gasification in the riser column of CFBs. However, their model only looked at the riser column, without consideration of the effect of solid circulation. In recent years, Liu et al. (2015), Geng et al. (2015); Guan et al. (2014) have used the MFM approach to investigate chemical looping combustion in three-dimensional full-loop CFBs. However, in these studies, heat transfer between solid phases was not considered. As pointed out by Wahyudi et al. (2016), inter-particle (or solid-solid) conduction is one of the important heat-transfer mechanisms operating in fluidized beds. In this study, biomass gasification in a three-dimensional full-loop CFB is investigated by using a MFM approach. Unlike previous studies, the conduction heat-transfer mode between solid phases (direct and through fluids) is considered in this current work. The simulation results are then compared in term of their capabilities to predict the syngas composition to models which do not include inter-solid phase heat transfer and those which include direct inter-solid phase conduction only. In this work, a numerical method of MFM framework with the inclusion of inter-solid phase heat transfer (direct solid-solid conduction and solid-solid conduction through an in-between fluid medium) of biomass gasification in a 3D full-loop CFB has been developed. The effect of the inclusion of inter-solid phase heat transfer and the behaviors of hydrodynamics and heat and mass transfer are then analyzed. The following conclusions are drawn: the MFM with consideration of all inter-solid phase heat-transfer mechanisms (direct and through in-between fluid medium) has a better capability for predicting syngas composition than models without inter-solid phase heat transfer or with direct solid-solid conduction only. Furthermore, the inclusion of direct solid-solid heat transfer only in the model does not have a significant effect when compared to the model without inter-solid phase heat transfer. It is demonstrated that there is a similarity in the spatial distributions of gas phase temperature and mass fraction of components in the gas phase. For example, the high CO concentrations in the upper region of the riser column and the cyclone might be related to the high temperature of the gas phase at these regions. The authors are grateful to the Directorate General of Higher Education, Ministry of Research, Technology, and Higher Education for financial support of this work under Fundamental Research Scheme 2017. Liu, H., Cattolica, R.J., Seiser, R., Liao, C.-h., 2015. Three-dimensional Full-loop Simulation of a Dual Fluidized-bed Biomass Gasifier. Applied Energy, Volume 160, pp. 489–501.